I want to thank everyone who left such thoughtful and helpful comments on my last post about finding balance. It's somehow comforting to know that I'm not the only one who struggles with it. The overall consensus seems to be to do what you feel like doing when you feel like doing it, if it's knitting today, drawing tomorrow, that's fine! I've got a new hat to share with you today. 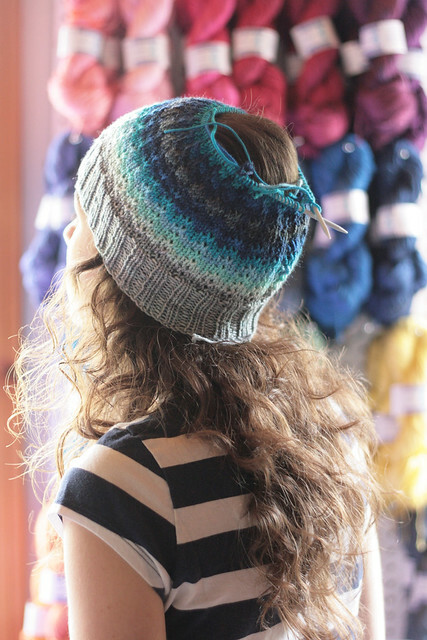 I knit this hat as a sample for my booth at the Knitter's Frolic last month. 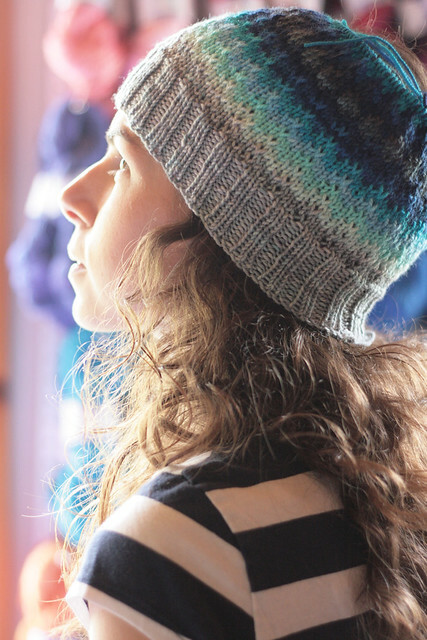 It's my Cabled Canuck pattern knit up in the new Orange Label yarn in the Shadow colourway. 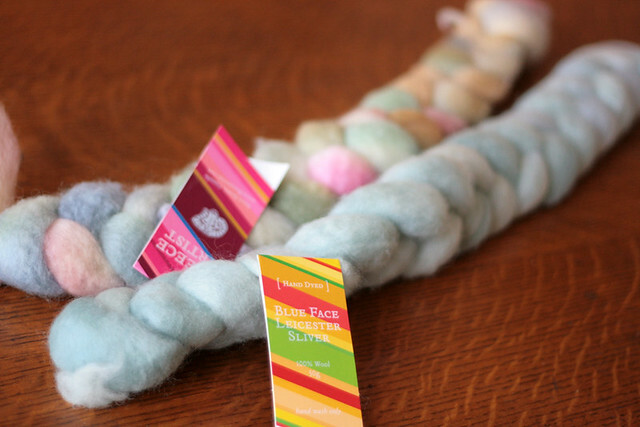 This yarn is so incredibly soft and silky (obviously, since it contains both cashmere and silk!) and in the shadow colourway it really looks like silver. I love it! 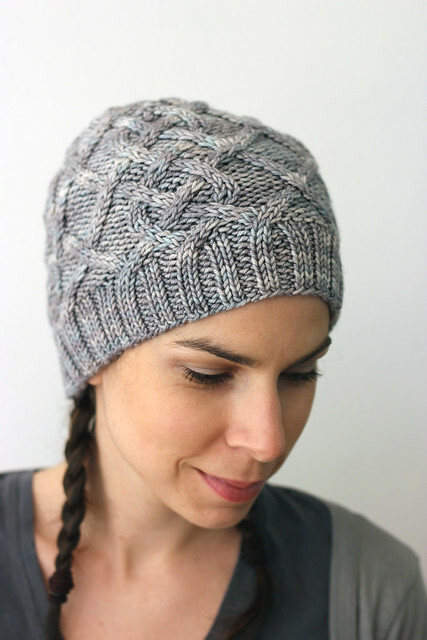 This hat uses just under 1 skein of yarn and is the perfect project to try out this amazing base. I highly recommend it! 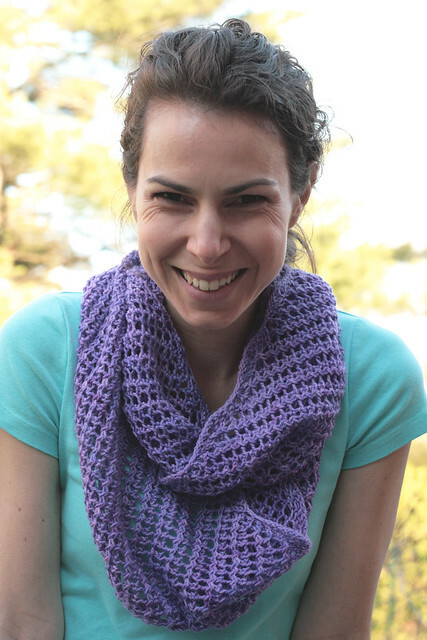 Do you remember this beautiful scarf from January 2011? Oh, what high hopes I had for this scarf. I expected it to be "the one" the scarf that I wore all the time, my go to, perfect and elegant scarf. Well, not so much. Upon completing this scarf I expressed a bit of concern about the fact that it rolled in on itself. I hoped that it would be manageable, but it wasn't. So I never wore it... maybe only once or twice when it was brand new. 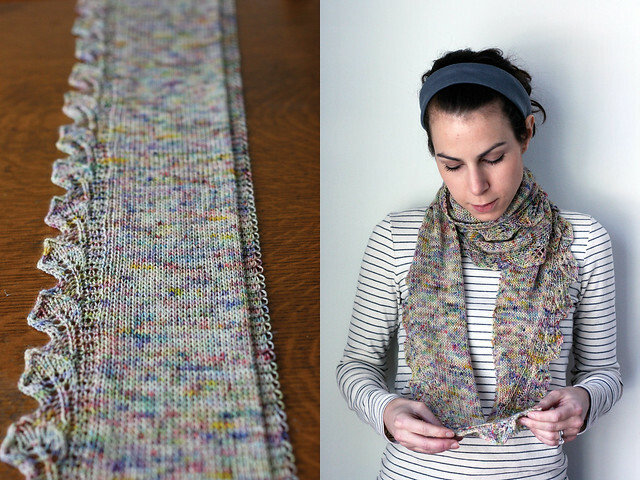 The yarn was too pretty to give up on, so I finally frogged this bad boy and have a new plan for the yarn. Another attempt at the perfect scarf, I'll keep you posted! Isn't that center photo awesome? That's what the yarn looked like immediately after frogging! A good soak and it relaxed back to it's initial state. I love all those crinkly strands, reminds me of when I used to get my mom to braid my hair when it was wet and after a night of sleeping on it I'd wake up with the best crimped do! My mom has a big box in her basement marked "Baby Keepers". It's full of baby clothes. My family has a long tradition of hand-me-downs. A lot of our wardrobe as kids came from my older cousins, and then got passed on to our younger cousins. 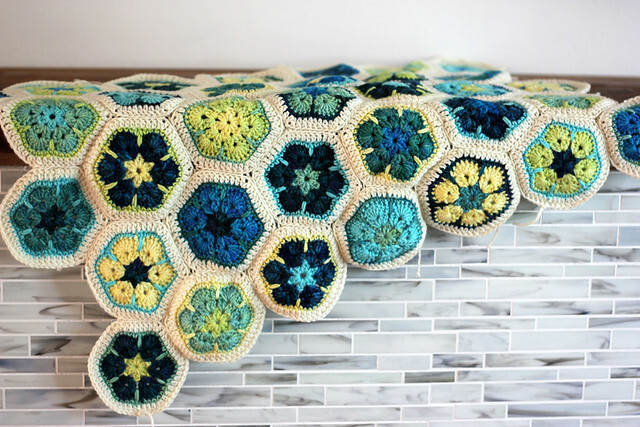 But some things, mostly handmade, were just too special for my mom to pass on, so instead she squirreled them away in a big box and now that her first grandchild is on the way (my brother's baby is due this July and we're all so excited!) it was time to go through the box and pick out some of the special keepsakes that will get passed on to him. Mom and I did that earlier this week. 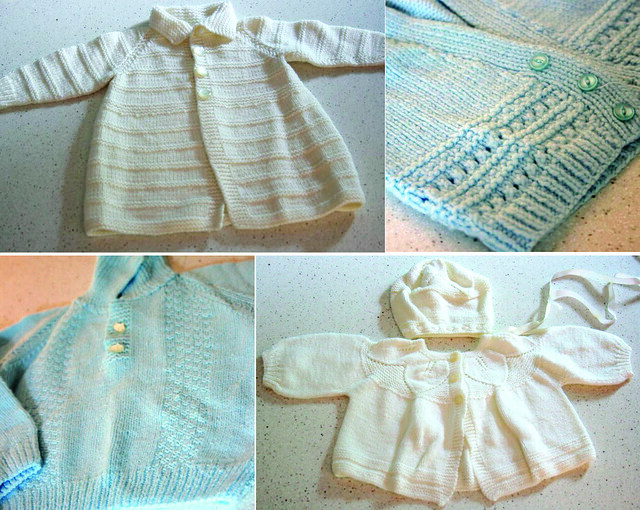 I recognized most of the adorable baby knits from seeing them in old photo's, or even remembering my sister wearing them. 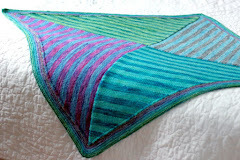 But I haven't really looked at them since I've become a knitter. I picked out a few of my faves to share with you today because I was so surprised to see that even though some of these things are over 30 years old, they're still totally hip. I love them all! 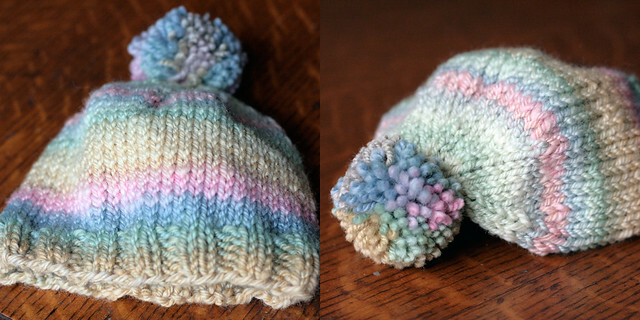 But then again, you know I love just about all wee baby knits. But obviously, knowing that Grammy stitched every stitch in these precious little sweaters makes them all the more special. 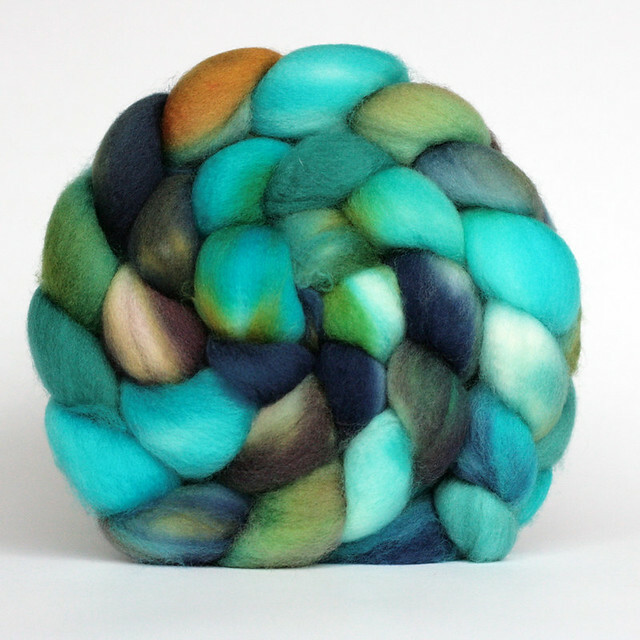 Chris dyed this roving and when I first saw it, I was not thrilled. Orange and green? What was he thinking? I teased him about it so much that I started to feel bad. I decided to give it a chance and spin it for him. Who knows, maybe this ugly duckling would turn into a swan! 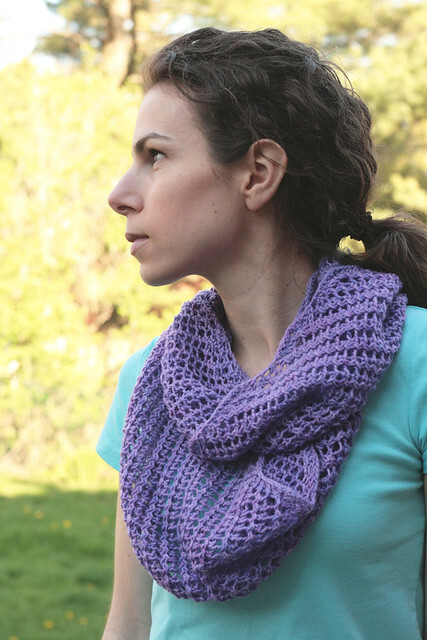 Well, now I've got mud on my face because this handspun is gorgeous! Just goes to show you really can't judge roving until it's spun. It's incredible how much it changes from beginning to end. Spinning is magic. Sorry Chris, I was wrong, you were right. This colour combo really does work. 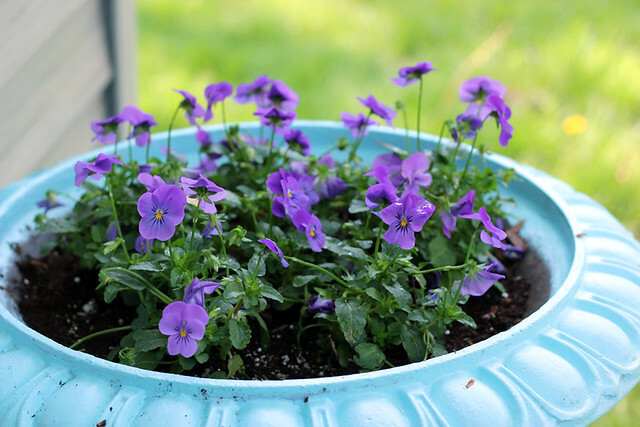 Pretty purple pansies in a turquoise urn outside the studio. Love those happy pansy faces. 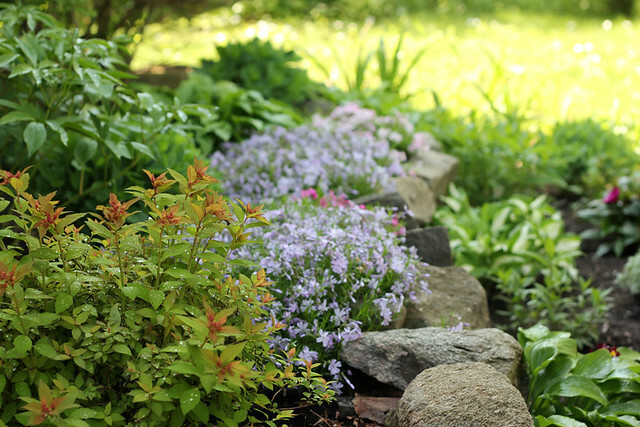 Last year Chris and I moved the rock wall that lines the raised portion of our front garden out about 2 feet so we would have more room for plants in front of the shrubs that run the front of our house. 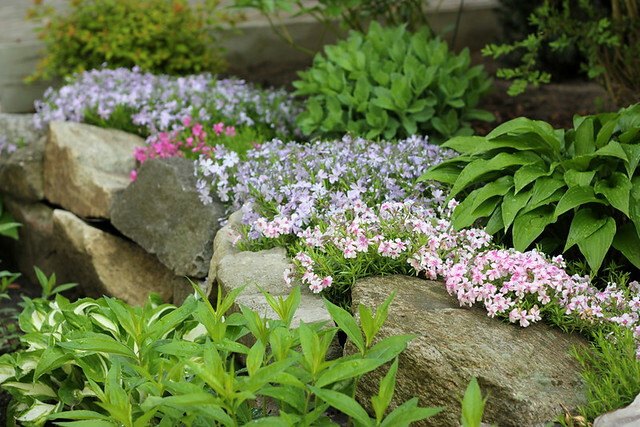 We transplanted a few hardy specimens (hosta and stonecrop are always reliable) and then planted a row of flox on the edge of the rock wall. Last year they were pretty, but still small. This year they are bursting! Cascading over the rock wall and looking so lush and lovely. 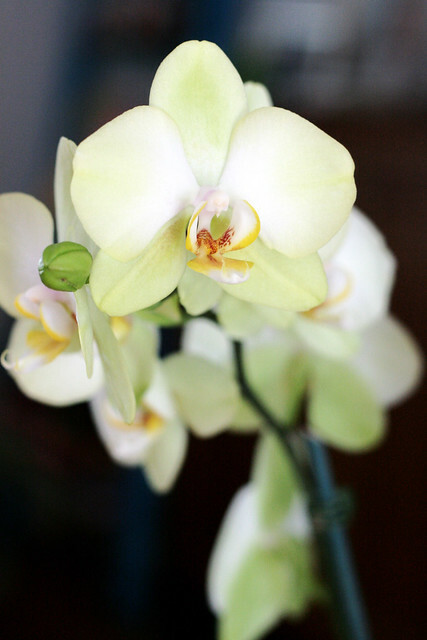 I think that it's the fact flox bloom early in the season that make them one of my favourite flowers. Early blooms are always so exciting! 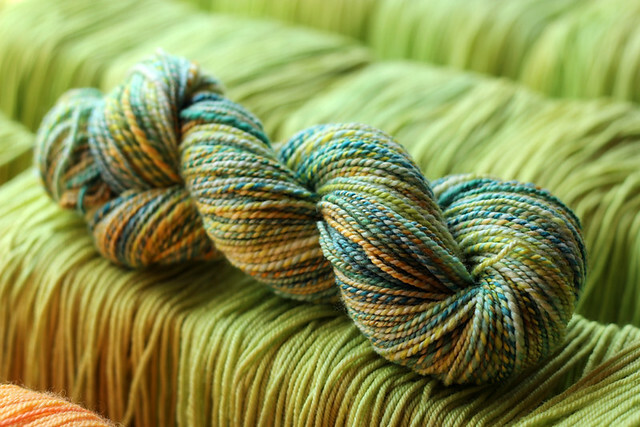 The TFA Colour KAL has officially begun! 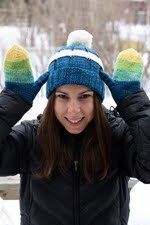 I took some time last week to do some swatching, but instead of just swatching a flat rectangle I decided to knit a hat. 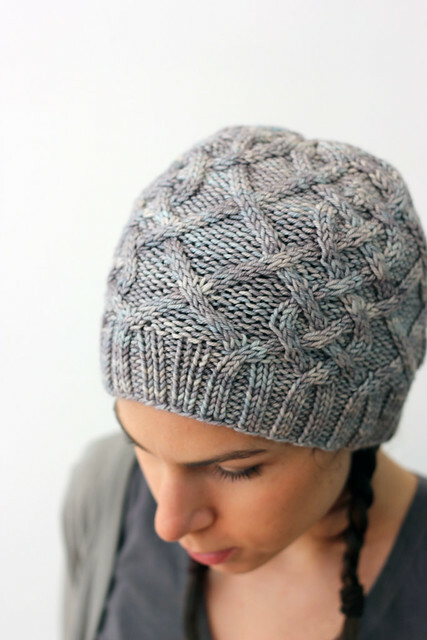 That way I could swatch in the round, figure out some decreases and after all the work and math was done, I'd have a hat! Bonus. 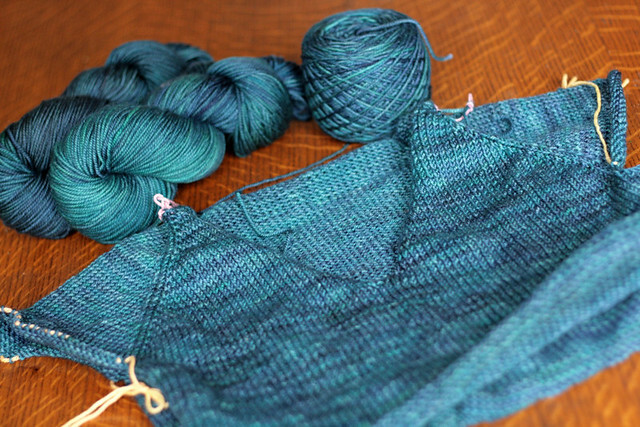 The swatch worked out well and now I just have a bit more math to do before I'm ready to cast on for my KAL sweater. I'll keep you posted on my progress! I may not have much time to work on it this week since I'll be a busy bee getting all the Club kits in the mail, but with my swatching all done I feel like I've already made good progress. Last year I did a Mother's Day blog post dedicated to my beautiful puppy Stella, not a single mention of my actual mom... how did I get away with that? This year, I want to dedicate this blog post, nay, this entire day! to my amazing, giving, supportive mother. I haven't mentioned this on the blog before, because it's a little heavy for a friendly knit-blog, but this year, life has really thrown Chris and I some curve balls. It hasn't been easy, but having my mom around, just a phone call away makes everything seem manageable. She doesn't always say exactly what I want to hear, but she's always right, and she always knows best. I know that I can count on her for anything and everything. From babysitting Stella, to labeling and packaging a couple hundred Club kits, to test knitting a pattern and giving me way more honest criticism then I asked for... I'm not sure what TFA would be without her and I don't even want to think about what my life would be without her (I'm getting all emotional just typing that). My mom is my best friend, she's my role model and she's a total star. I love her to pieces and look forward to spending all day with her today while she relaxes and is pampered by her adoring children! Thanks for everything mom, I love you. 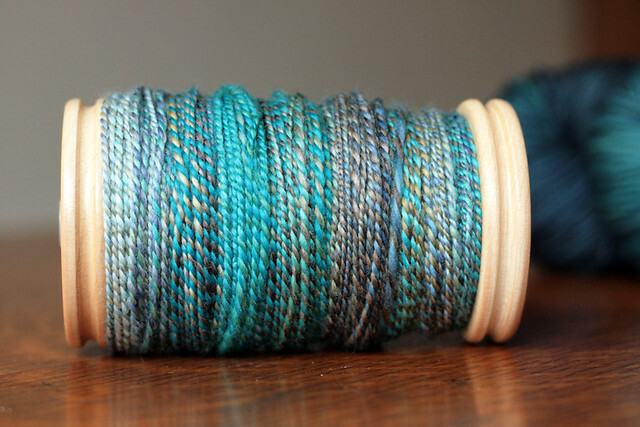 This is the result of last week's spinning. 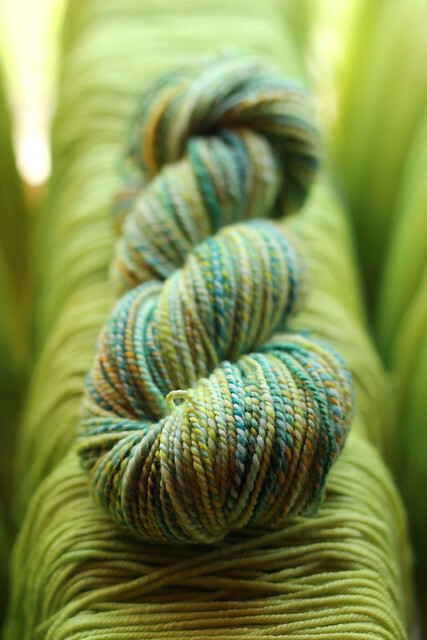 I hoarded a braid of my favorite hand dyed roving and spun it into this glorious 2-ply yarn. 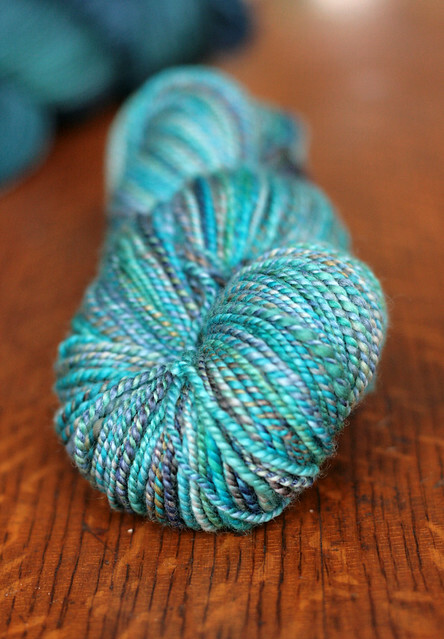 I think it's my favorite skein of handspun yet. 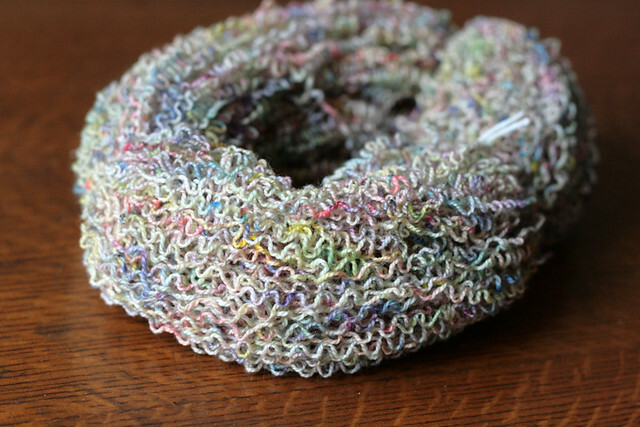 I'm going to make myself a really simple slouchy hat with this yarn. I've finally taken on the task of turning some of the baby sweaters I've been knitting into "outfits" all set for gifting. 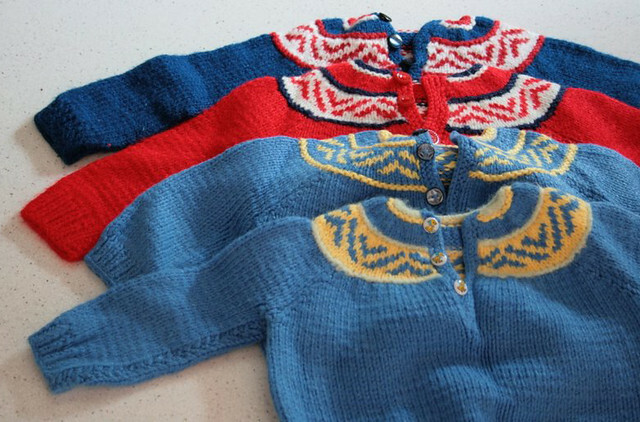 I've got a few sweaters stashed away for gifts, and though a knitted sweater is awesome, the cuteness factor is kicked up a notch if said sweater has a pair of matching booties! I've hopped on the bootie train and I can't get off. 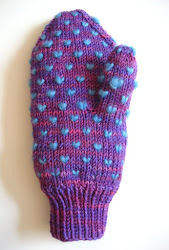 So far I've used Saartje's Bootees pattern and the Oh! 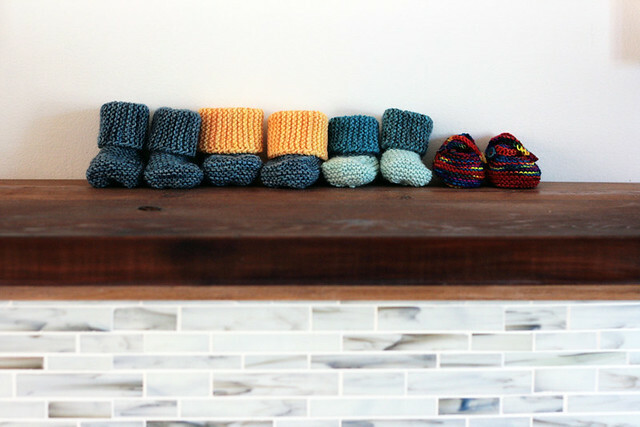 Baby Baby Booties pattern. Saarje's Booties are adorable because they're so small and cute, but I think that I prefer the second pattern because the booties really seem like they would actually stay on and they kind of look like hip little baby Ugg boots, and while I'm not really into Uggs for adult, I completely approve of the look for babies! I woke up this morning feeling very lucky. Yesterday's Etsy update was a success, which is always a bit overwhelming. I love what I do, dyeing, designing, running TFA, and the fact that you all appreciate it enough to make it possible for me to do this as a career is incredible. Chris, Stella and I all thank you very much. Our lives aren't glamourous, I spend most days in my pajamas, we have a modest house and we stay in most nights, but we spend our days together doing what we're passionate about and that makes us feel incredibly lucky. 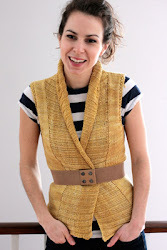 I'm working away at a very simple, no-frills, v-neck pullover in a ooak colourway. 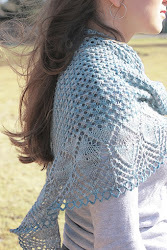 It coordinates quite nicely with my latest bit of handspun! 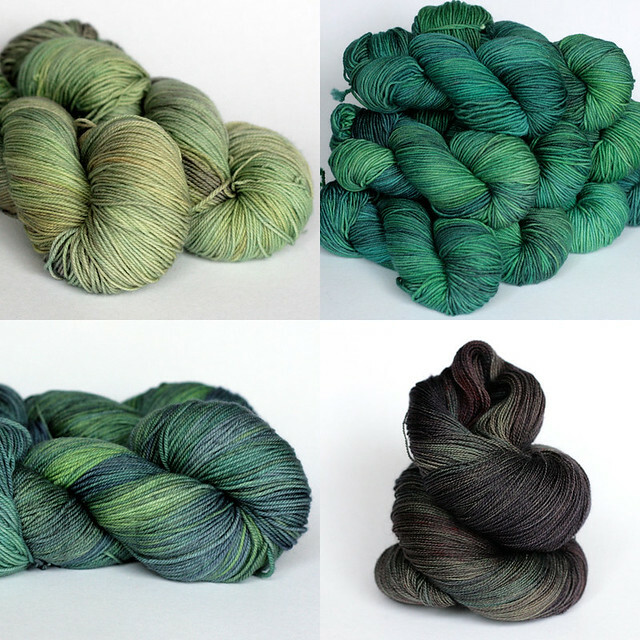 There will be a Etsy Update today at 12pm (EST) aparently we had a thing for greens this time around. So many lovelies! You know I hate to part with them, I just hope they go to good homes! 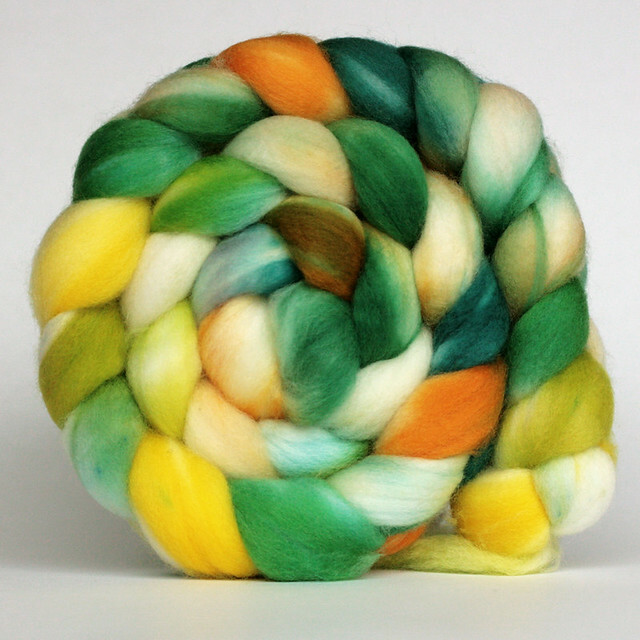 We also dyed a whole bunch of roving for this update, which I'm pretty excited about. 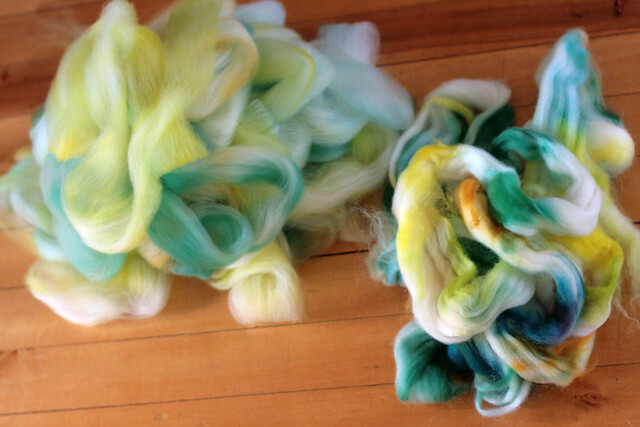 I LOVE hand dyed roving and I'm really happy to be back in the roving game. Below is my favorite braid of the day. It has been months since I pulled out my spinning wheel. I don't think that I've done any spinning since last June! Shame on me. 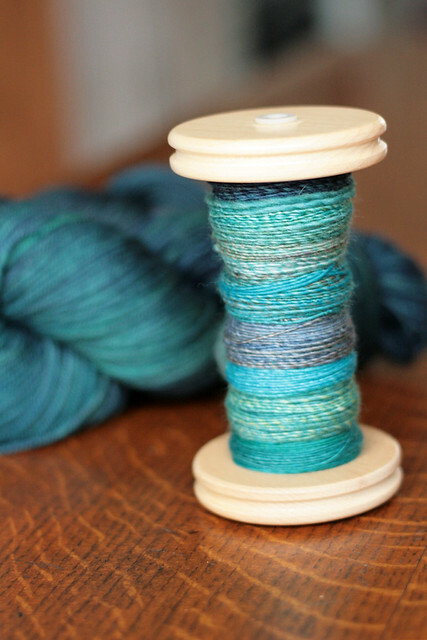 I think that one of my problem's is the fact that I cherish my handspun so much (probably because I'm no expert and it typically takes me 2 or 3 nights of dedicated spinning time to spin a skein of yarn, it's a lot of work! 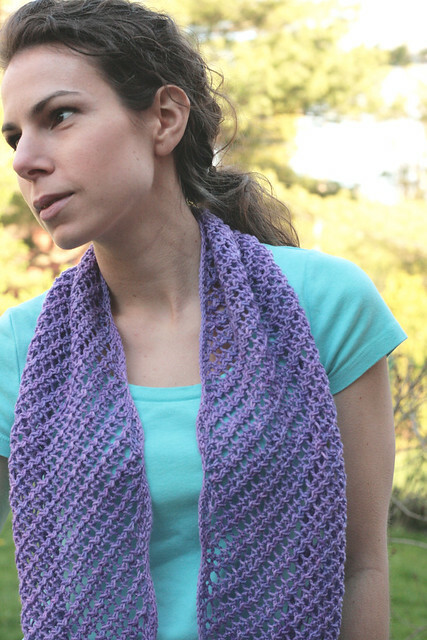 I need to make sure I find just the perfect project for the special skein when it's all done.) Anyways... After knitting the adorable little Garter Yoke Baby sweater with some handspun I have made a new commitment to spin more often. For me, spinning is really quite a bit like meditation. It's repetitive, slow movements, I don't count, I don't really even think while I'm doing it. It makes me feel very relaxed and very zen. I could use a little more zen in my life, so I'm going to try and spin once a week from now on. 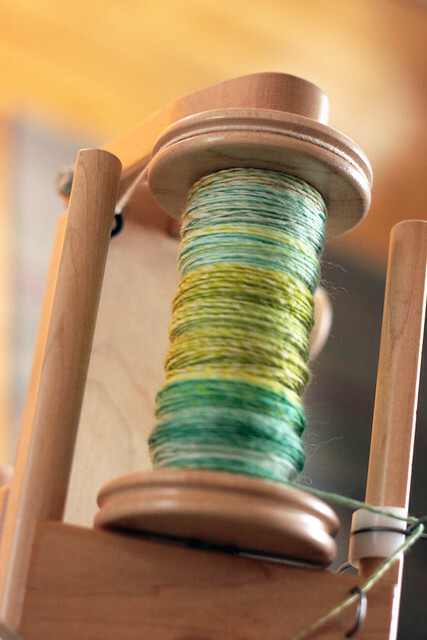 Like most things, my spinning mojo tends to come in fits and spurts, so we'll see if I can keep it up... I'm going to try my best! On that note, last week I dug out these braids of roving that had been marinating in the stash for oh, maybe 3 years or so! 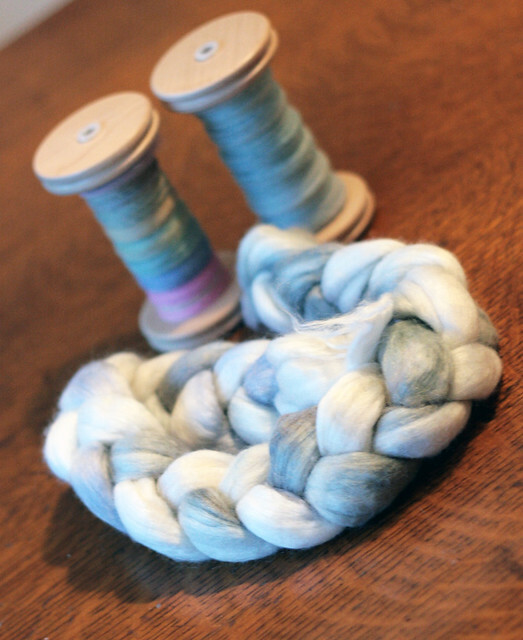 I spun the singles and thought that they were just lovely, but the pale, silvery blue braid on the right was so subtle and beautiful that I decided to pair it with some merino/silk silvery grey roving that I had bought at the same time. 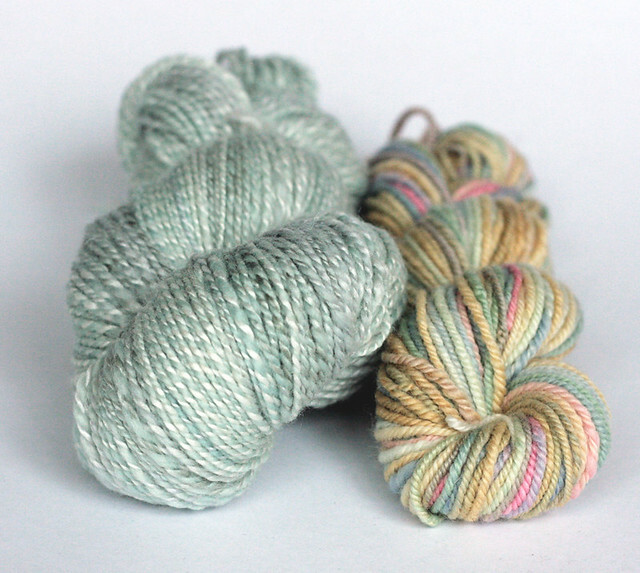 I plied the soft silvers together and got a really pretty, soft grey skein. 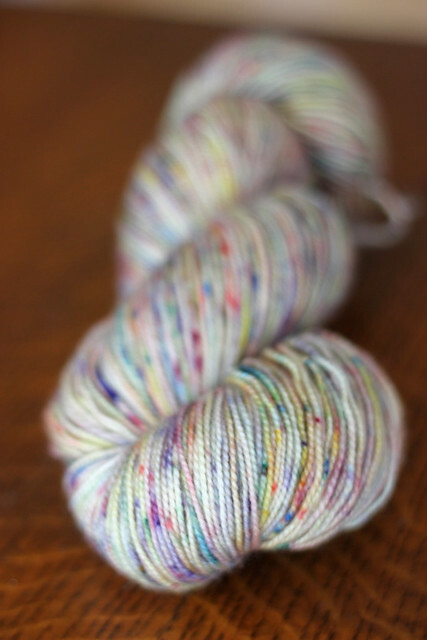 Then, I navaho-plied the pastel singles. That was cool. Watching the colours shift was really fascinating. I even made Chris watch me while I navaho-plied for a bit, man, he's a real trooper. 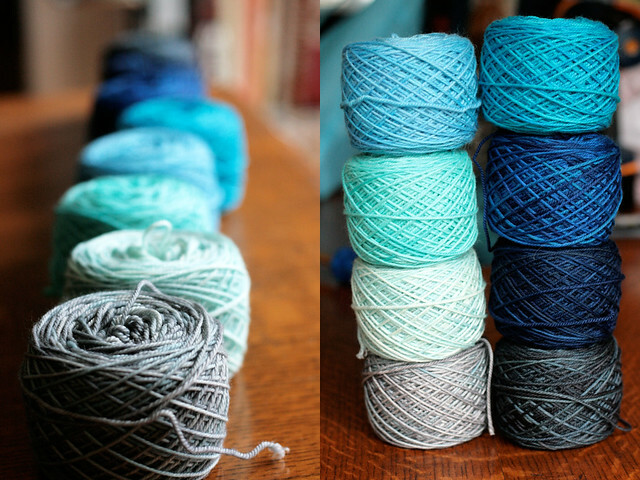 I'm not sure what the skein on the left will become, but the skein on the right will most likely be something baby-oriented. Those soft pastel shades just have baby written all over them! And with only 50g, maybe I can get a wee hat out of it.